From musicals American Idiot and Jersey Boys to classic Hitchcock adapted for the stage and an appearance by the Doctor himself, Peter Capaldai, there’s some great entertainment on offer in February. Here’s our pick of the bunch. The Playhouse recreates the scene of a buzzing Honky Tonk in downtown Nashville, perfectly capturing the energy and atmosphere of an evening in the home of country music. With Dominic Halpin, Shelly Quarmby and backing band the Hurricanes presenting such songs as Ring Of Fire, Crazy, Sweet Home Alabama, Need you Now and 9-5, it’ll be just like being there, in your cowhide leather boots and spangled stetson. Parking for trusty steeds by arrangement. 7.30pm, from £22.50. Anthem after anthem, riff after riff, solo after solo, the Classic Rock Show at the Queen’s Hall brings the original recordings back to life on stage with a huge sound and light show to match and ulminating in a show-stopping guitar duel that is definitely not to be missed. 7.30pm, £26.50-£36.50. The thing to remember about Silent Film is that movies were never actually silent – they had musical accompaniment, and maybe even a Film Explainer to help the less literate with those pesky intertitles. Here’s a chance to see one of the earliest horrors, with a live, new musical score by Dave Abbott. John Barrymore – no, not Barrowman, BarryMORE, Drew’s grandad – plays Robert Louis Stevenson’s unfortunate quack and his ’orrible other ’alf. Leith Depot, 4pm, £8. Join Manipulate and enter a vivid and captivating world of brilliant Scottish and international visual theatre, puppetry and animated film at the Traverse Theatre, see website for details. Green Day’s explosive rock musical, based on their concept album of the same name, returns to the UK for a special tenth anniversary tour and comes to the Edinburgh Playhouse. The story of three boyhood friends, each searching for meaning in a post 9/11 world, it’s on at 7.30pm, tickets from £17.90. With riotous rhymes which have delighted children for more than 50 years, and infectious humour and spectacular circus for the grown-ups, the wonderfully anarchic Cat in the Hat comes to the King’s Theatre. Will Seuss amuse? Find out at 7pm, tickets £18.50. It’s 1917. In a remote English village there are rumours of an enchanted wood that only appears on Midsummer night. One of the inhabitants – a mysterious man – invites eight strangers to stay. One evening, the wood miraculously appears and the guests feel compelled to enter . . . Threepenny Theatricals bring their magical new 2019 production Dear Brutus, from J.M. 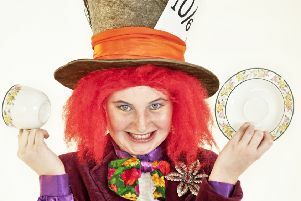 Barrie, Scotland’s very own master of fairytale and author of Peter Pan, to Church Hill Theatre. 7.30pm, tickets from £8.50. Enjoy a mixture of The Beatles’ singles and classic album tracks and Fleetwood Mac’s entire Rumours album from musical duo The Boyds at Howden Park Centre, starts 8pm, £10. An evening of world-class stand-up as the Irishman from Australia brings his brilliantly observed, ever-evolving and hilarious comedy to the Queen’s Hall, fresh from a smash-hit New York off-Broadway season. 7.30pm, £18.50. January, February… it’s the perfect month to catch the Scottish songstress in concert with her brilliant band, playing the hits that have sold millions. See her at the King’s Theatre, 7.30pm, tickets from £27. The Stand’s long-running weekly beginner’s showcase offers up to ten new acts – some treading the boards for the very first time. But to guarantee laughs, you can also see a few experienced hands, including tonight’s host, Jay Lafferty, and headliner Morgan Rees. All for just £3, show starts 8.30pm. When Serge spends an extortionate amount of money on an all-white modernist painting, his close friends Marc and Yvan are baffled. But does their violent reactions to this provocative canvas mirror more dangerous antagonisms towards each other? Yasmina Reza’s study of friendship, prejudice and tolerance comes to the King’s with Nigel Havers, Stephen Tompkinson and Scotland’s own Denis Lawson commanding the stage. 7.30pm, tickets from £10. Sick of all the hearts & flowers and smug couples? In a smug couple but tired of being told when to buy overpriced flowers? Join Rachel Fairburn, Keir McAllister, Robin Grainger, Wayne Mazadza and Gus Lymburn at The Stand for some dark humour. 8.30pm, £3-£6. It’s St Valentine’s Day and love is in the air in revolutionary Paris as students rise up and fugitive Jean Valjean bids to escape the cultures of petty policeman Javert. With rousing songs from Alain Boublil, Michael Schönberg and Herbert Kretzmer, this is one for the ages. Join the revolution at the Festival Theatre (if you can – it’s returns and late realse tickets only) from £32. If you miss today or tomorrow, it’s on One Day More. If your idea of excitement extends beyond the Star Wars films to Luke Skywalker’s hand double, get along to Edinburgh International Exchange Centre for a packed programme of guests, talks, screenings and memorabilia. Guests include Peter Capaldi, late of those tiny coffee bars you see all over Edinburgh, and from the world of comics, All-Star Superman and Batman Inc artist Frank Quietly. Doors open 10am, adult day pass £10, children £5. Why should grown ups have all the fun? Comedy Kids is a fun filled show packed with stand-up, sketches and improv performed by the comics of the future. Mentored by the terrific Jay Lafferty, these sprogs could have what it takes to be the stars of the future. Cheer them on at The Stand at 2pm, tickets £5. The inventor of the 5:2 diet, a man always willing to down a tapeworm in the cause of science, is in town to talk about his adventures as one of TV’s top medics – and provide tips on how to live a healthier, stress-light life. See him at the King’s at 7.30pm, tickets £26.50. While travelling in continental Europe, young playgirl Iris realises that an elderly lady seems to have disappeared from the train . . . but everyone she asks about it denies the woman was ever aboard. Can she solve the mystery? Alfred Hitchcock’s famed Thirties thriller is adapted for the King’s stage with Lorna Fitzgerald, Matt Barber, Robert Duncan, Philip Lowrie, Ben Nealon and husband and wife Juliet Mills and Maxwell Caulfield. 7.30pm, tickets from £19.50. Beggin’, December 1963 (Oh What A Night), Can’t Take My Eyes Off You, Bye Bye Baby and more feature in this dramatisation of the story of Frankie Valli and the Four Seasons. It’s been to Edinburgh a fair few times but never fails to dazzle. That would be the shiny jackets the boys wear – few jerseys are on display. Walk Like A Man (or woman) to Edinburgh Playhouse, 7.30pm, tickets from £21.90. Winner of the Carol Tambor Best of Edinburgh Award as well as a Scotsman Fringe First, the most talked-about show of the Edinburgh Festival Fringe 2018 returns fresh from a smash-hit, sold out Festival run. Jay is the American Oscar-winning actor taking the lead in a new play that connects with his Irish roots. Leigh is the English director who will do anything to get noticed. And Ruth is the Northern Irish playwright whose voice must be heard. Fireworks ensue. Traverse, 7.30pm, tickets £5-£20. Some of us wouldn’t be keen to do much more on our 60th birthday than have a nice family meal at the local franchise restaurant. Sir James Macmillan is made of stronger stuff – the Scottish legend will be conducting two of his most famous works, percussion concerto Veni, Veni, Emmanuel and Seven Last Words from the Cross at the Queen’s Hall. Join the celebration at 7.30pm, tickets £6-£35. One of the most revered voices in music and a figurehead of soulful pop for decades returns to Edinburgh. You’ll know him from such bands as Ace, Roxy Music, Squeeze and Mike + the Mechanics, he’s the voice on such classics as How Long, Tempted, The Living Years and Over My Shoulder. Carrack’s songs have been recorded by artists such as Linda Ronstadt, the Eagles and Diana Ross and he’s played with everyone from Elton John to The Smiths (yes really – look it up) and Madness. Find out why everyone wants Paul Carrack when he plays the Festival Theatre, 7.30pm, tickets £34.50-£39.50. Applauded across the globe for their stunning live performances, films and TV appearances, all-male dance company BalletBoyz – that ‘z’ was cutting edge back in the day – are back with two brand new works, both set to original scores by world-class composers. Catch their seriously seductive stylings at the Festival Theatre, 7.30pm, £17-£26.50. Set sail with the award-winning grand dames of Scottish comedy, Jojo Sutherland and Susan Morrison, in Fanny’s Ahoy! Catch them at The Stand at 5pm, £5. Vass, one of Scotland’s foremost trad musicians, brings his remarkable new song cycle to Edinburgh for the first time. Vass’s music transcends genre boundaries, drawing influence from the neo-classical, indie-folk and electronic worlds. See him at the Traverse Theatre, 8pm, £11. They’ve had a bit of a rest from the daily – sometimes twice-daily – grind of panto performances, and now Allan Stewart and Grant Stott are back on the King’s stage for the latest edition of the annual family fun-fest. Says Allan: “This year, in addition to the one and only Grant Stott, I’ve rounded up one hilarious magician (Mandy Muden, fresh from Britain’s Got Talent), one hilarious musician (the wonderful Kev Orkian returns with all new jokes and songs) and the rocking Soul Nation Choir, all backed by the full Andy Pickering Orchestra.” How could you resist? 7.30pm, £28.50. Shortly after Sam and Molly move into their new apartment, Sam is murdered, leaving Molly bereft. Thank goodness she has her potter’s wheel, Unchained Melody to listen to… and visits from her ghostly lover courtesy of the local psychic conwoman. The musical version of the Patrick Swayze/Demi Moore film is at the Playhouse, 7.30pm, tickets from £22.50. Having have sold more than ten million records worldwide, Mike and the Mechanics – currently Mike Rutherford of Genesis fame, R’n’B legend Andrew Roachford and former Phantom of the Opera Tim Howar – have embarked on their Looking Back Over My Shoulder Tour. They’re at the Usher Hall, 7.30pm, tickets from £38.50.